At Compassionate Communication Center of Ohio, we envision a world where people are connecting across differences and resolving conflict nonviolently and collaboratively - not through the use of violence, force or coercion, but instead by connecting with our common humanity and engaging our compassionate nature. A world, where people find creative and interactive ways to transform their conflicts through a process of communication that connects us across differences in gender, age, race, sexual orientation, religion and political beliefs. A world where peace, mutual respect and compassionate relationships are the norm. 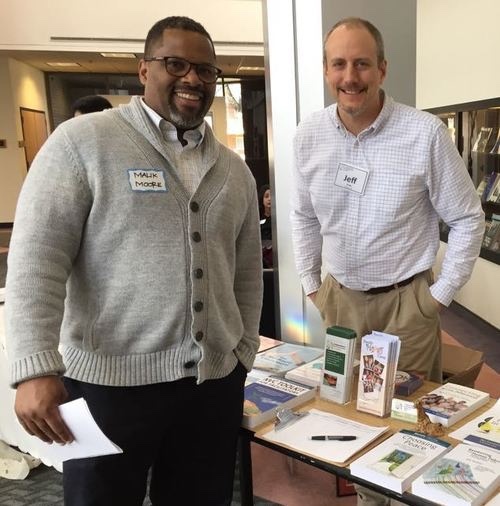 Malik Moore (pictured left) and Jeff Brown (right) YMCA of Central Ohio in 2015. Offers life-enriching tools to create an environment where people use communication to exchange the information necessary to resolve their differences peacefully. Emphasizes emotional intelligence over intellectual analysis by providing a life-changing way of interacting that facilitates the flow of communication with a focus on universal human needs by employing emotional intelligence in expressing what’s going on in people. Raises the bar for communication by relying on objective observations rather than evaluations. Avoids making people defend themselves from value-laden judgments by employing clear requests in place of demands. retribution, or loss of self-esteem.